Is my company or organization still in sync with this market?. If markets and customers change, then players have to cope with this change to stay competitive. The photography and video market has changed and companies like Kodak have lost their leadership. The music market has been put upside down by Napster, then iTunes molded and now Spotify is changing it all again. So, when the carpet on which we stand moves, there are those who stay and those who fall. "Searching for the truth is easy. Accepting the truth is hard." Why did some companies fall when their markets changed? Very often because they did not accept the new reality. This happens in business, in personal life, and also in politics. Everybody looks at the same world but it is human to interpret the world differently, according to the own values, education, attitude, etc.. We tend to neglect those things for which we don’t have a solution or... sometimes we focus only on those things that support the happy status quo or... we lower our guard because we are currently riding on success. Accepting the new reality is hard and after all, nobody wants to move out of a comfort zone. Accepting that customers think differently is a common mistake that even very successful executives make. Steven Sasson started working for Kodak in 1973 and two years later he invented the first digital camera. But his managers thought that nobody would want to see pictures on a TV. When the first iPhone was presented to Steve Ballmer from Microsoft, he thought that it would not appeal to business customers because it had not keyboard. In both situations, top executives underestimated the customer reactions and did not realize that customer where demanding a change for the industry. The truth is that change is an intrinsic part of our present and indispensable part of our future. As this year begins, it is time to review our market and identify the new reality, the changes, the trends, the new players. The new reality is beyond "the obvious". n order to fine tune your business strategy, it is necessary to understand the market changes. This needs to be a specific task in a busy schedule. You can do it alone or invite your department members to discuss this topic. You can also talk to customers about how they see the market and if they perceive the need for a change in your products and services. When doing this exercise, just gather facts without considering implications. Otherwise you will filter out again those things for which you have no solution. are customers requesting more or less of what we offer? which products or services where hard to sell and what did customers think about our offering? have customers changed their mind about our products? which customer needs were not responded because we are not flexible enough or it was not our "core business"? how easy would it be for another company to take away some or all of our business? who would benefit if we just keep doing what we do without change? 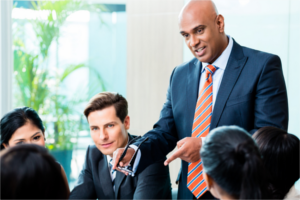 So, what would an external person say about your market and your company position? A person, which has no baggage of the past and only good intentions for the future? When Satya Nadella took over as CEO of Microsoft two years ago he sent a letter to all employees on the first day presenting himself and giving an outline of what needed to be done. In this e-mail he clearly indicated “Our job is to ensure that Microsoft thrives in a mobile and cloud-first world”. This was the hard truth for the company. Until then, Microsoft wanted to push for a PC-centric world and it must have been hard to accept (from one day to another) that the world was mobile and cloud-centric, both areas in which Microsoft wasn’t strong at that time. Accepting the truth was the first step. Building a strategy to cope and win in the new reality was the second step. 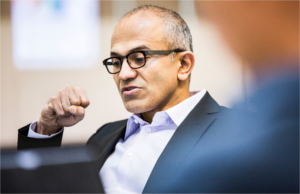 The results of Satya Nadella’s management are starting to bring fruits. Two years later Microsoft has been revitalized is now 2nd in cloud hosting (after Amazon), first in cloud office and is working hard to combine the PC and mobile world with Windows 10 (*). 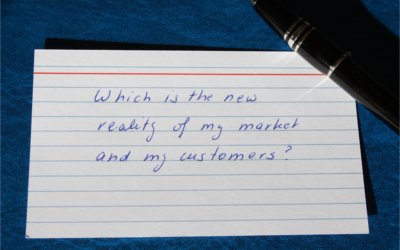 Considering all what was said, my “focus card” for these next days is “Which is the new reality of my market and my customers?”. I want to look for new facts, solutions will follow. After the yearly market assessment you will feel that you are taking the right path in world of Digital Economy because because the future is for those who stay hungry for new opportunities and are brave enough to face the challenges of change. If you wish to have an external view on your REALITY CHECK, please contact us at info@calvisystems.com. The biggest change will be when the millenials start working and become active.